Throughout Belinda’s schooling and medical training, she has been interested in and committed to providing better healthcare for the developing world. She ultimately intends to work in international health, hopefully in a surgical role. She submitted this elective report to the AMSJ as a final year medical student. 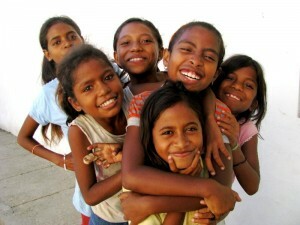 Timorese girls from the Gleno Orphanage, located about 40km or a two hour drive from Dili in the Emera Mountains. The mobile clinic from Bairo Pite Medical Clinic visited the orphanage monthly. The medical elective is notorious for being an excuse for taking a holiday in an exotic corner of the world. Like many of my colleagues, I also travelled to one such corner, Bairo Pite Clinic in Timor-Leste (the official name of East Timor), in search of an adventure with some medical experience thrown in. In retrospect, those six weeks were without doubt the steepest learning curve of my medical training. However, there are a number of things I wish I had known and a great number I would have done differently. Therefore please let me share some insights I have gained with use of the retrospectoscope – the device in medicine which enables the viewer to judge past events or actions with the aid of knowledge obtained since they occurred. This is in the hope of equipping you with some knowledge to make your elective experience the time of your life. I arrived in Dili, the hot, dusty capital of Timor-Leste after an almost sleepless night in Darwin airport and with a four-word vocabulary of Tetun, the local language. Nevertheless, I was almost immediately loaded onto the clinic’s four-wheel drive ambulance to embark on my first of many mobile clinics into the mountains. For such clinics the four-wheel drive is loaded up with a box of very basic medications, and a driver, a doctor or medical student and a medications dispenser drive up to six hours on a road resembling a goat track to a remote village. There, they see a queue of patients – some waiting, some materialising from the surrounding forest- and drive back, often with acutely ill patients. And thus was the experience from which stems my first insight – learn some of the language. Despite having an ‘interpreter’ – she spoke as much English as I spoke Tetun – I was luckily armed with the Lonely Planet Tetun phrasebook, which I think saved more lives than I did that morning. Daily Tetun lessons, jotting phrases on the back of my hand and the phrasebook ensured I quickly picked up enough language to hold a reasonable medical consultation. Despite this, I wished countless times I knew some Tetun before I arrived in-country. If you are planning on travelling to a non-English speaking country, do try and learn some local language before you depart. Being able to communicate with your patients makes a world of difference. After my mobile clinic baptism of fire, I returned to the Bairo Pite clinic in Dili to be confronted with the afternoon ward round, and a lady in the final stages of labour. Prior to my elective I had seen one patient with tuberculosis (TB) and delivered five babies. Score at the end of the first ward round: 67 TB patients and eight babies delivered. I vividly recall returning to my room that night acutely aware of how much I did not know. I sincerely wished then that I had taken the time to read up on the common problems experienced in Timor: tuberculosis, malaria, labour and its common complications and gastroenteritis. A basic understanding of how to identify and manage these conditions in resource poor countries is essential to getting the most out of your elective. The World Health Organisation (WHO) has some great articles on managing these and other health issues specific to the developing world. [1-4] I thoroughly recommend utilising these prior to and during your elective. Along with the Lonely Planet phrasebook these articles saved a number of lives. Before travelling to Timor-Leste, a number of people warned me against thinking I could change the world in six short weeks. And, yes, I completely agree with them, it is not possible. However, do not allow anyone to convince you of the disillusion that you cannot make a difference, but, like chocolate cake, there is a delicate balance between too much and too little. During my time in Timor-Leste, I fluctuated between strategising how to revolutionise their health system and becoming exasperated with the staff, the patients and the system itself. I only found this happy medium after many discussions with long-serving expatriates, my supervisor, the famous Dr Dan Murphy and a 24 hour flight using the almighty retrospectoscope. Be aware that revolutionising the local health care system includes ensuring nurses actually take observations rather than just filling in normal results; it is amazing how your patient can be saturating at 99% when the clinic does not have a working saturation probe! The work ethic in Timor is much more relaxed than the Australian system, and it is worth remembering that the way you are used to is not necessarily superior and you are the visitor, so embrace and work along with their system. And remember, change on a big scale, if you want it to last, takes time, dedication and education. So if you are planning a revolution, be prepared for your elective to go for six years rather than six weeks. 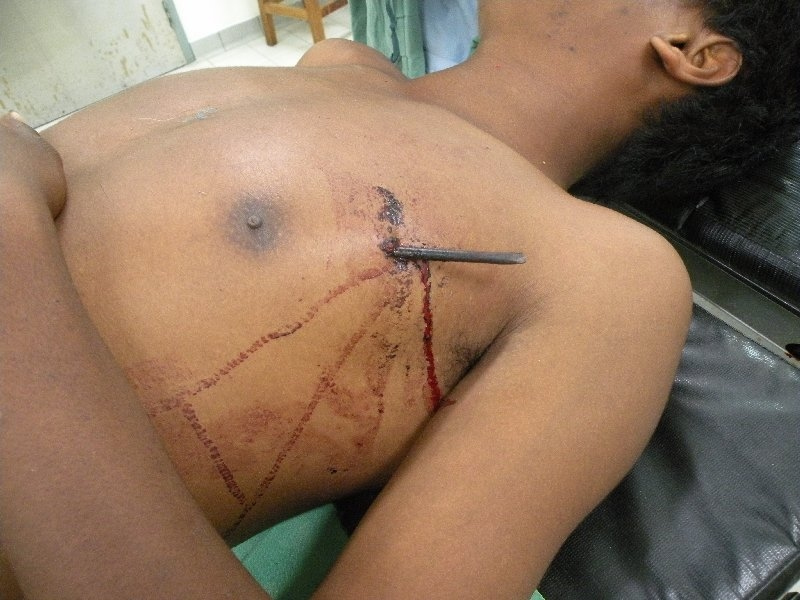 The arrow head was lodged in the young man’s right atrium. In order to remove it we did a transverse thoracotomy and made a pericardial window. After placing a purse-string around the arrow shaft we removed it, although we had to extend the entry site a small amount in order to remove the barb. Then, we pulled the purse sting taught and oversowed the pericardium (i.e. when repairing the pericardial window you overlap the edges to prevent tamponade in the event of leakage). He made a remarkable post-operative recovery. He was demanding food in an hour and asking when he could go home in two hours! Thankfully he didn’t develop any infections, and because we didn’t open the pleura at all, he didn’t require a post-operative chest-tube. All of this meant he was discharged home after three days. I saw him again about four weeks later and you never would have guessed he had been in hospital, let alone had an arrow pierce his chest!